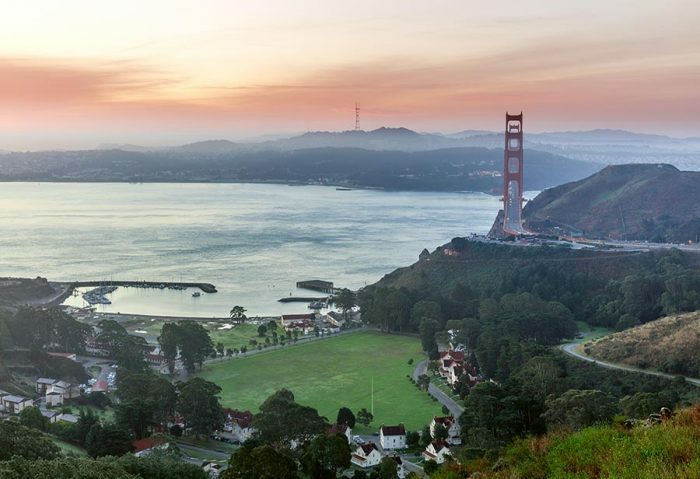 A recent PropertyShark analysis found that half of the nation’s 10 most expensive real estate markets are located in the Bay Area, and now another study underscores the region’s impressive wealth. SmartAsset has ranked America’s 25 most affluent counties using Internal Revenue Service income-tax data from 2016. Marin County stands as the third-wealthiest in the U.S. behind Teton County, Wyoming and New York, New York, with the average tax return reporting an annual income of $169,528. Residents of Marin County earn 53 percent of their incomes from wages and salaries, while 25 percent comes from investments. San Mateo County follows in the No. 4 position, with the average annual income pegged at $156,724. Santa Clara County was close behind at No. 5, where residents took home $155,522 in 2016. San Francisco is the only other California city that cracked the top 25, coming in at No. 9 for yearly earnings. The average San Franciscan earns $141,416 on an annual basis, with wages and investments accounting for nearly 90 percent of the total. Despite multiple reports of a California exodus, plenty of Golden State denizens are choosing to stick around, thanks to a thriving economy, scenic beauty, and an appealing climate . Citing U.S. Census Bureau data, The Mercury News reports that only 0.4 percent of California’s population moved elsewhere in 2017, the third-lowest rate of out-migration in the country. Just more than 5,000 California residents fled the state last year, the first time that statistic has dropped since 2014. Still, only 10 percent of Californians arrived from another state in 2017, the lowest rate of in-migration in the country and representing just 1.34 percent of the total population. As the article notes, fewer newcomers make it more difficult for business to fill open positions, which could be particularly problematic in the long run as the state’s high cost of living is prompting many couples to delay having children or sacrificing starting a family altogether. A 2019 housing market forecast from realtor.com predicts that the situation will only get tougher for would-be buyers in the coming year, and consumers overwhelmingly agree with that sentiment. Third-quarter survey results from the National Association of Home Builders found that 71 percent of potential homebuyers expert their searches to get more difficult or stay about the same in the months ahead. More than 60 percent of real estate shoppers say that there are fewer homes on the market in their area than there were three months ago. Despite the many challenges that millennials face on the journey toward homeownership, they are a bit more optimistic about the housing market than older generations. More than one-fifth of millennials expect their home searches to get easier moving forward, compared with 18 percent of Gen Xers and 15 percent of baby boomers. The Los Angeles Dodgers may have fallen to the Boston Red Sox in this year’s October classic, but Southern California still ranks as a better baseball town than Massachusetts’ largest city. At least that’s according to a WalletHub study, which determines America’s top sports cities by evaluating more than 50 criteria on a 100-point scale across the five most popular athletic games. Of the 419 cities included in the analysis, Los Angeles ranks No. 2, with a score of 50.14. Although Boston narrowly took the overall No. 1 position, that city ranks as the country’s eighth-best city for baseball fans, while only New York is better for that sport than Los Angeles. Buoyed by the Golden State Warriors’ recent stretch of dominance, Oakland ranks as the nation’s third-best city for basketball junkies, coming in at No. 9 overall. San Francisco falls further down the list at No. 24, boosted by its baseball ranking but likely held back by the woeful 49ers, a franchise that has not won more than half of its games since moving to Santa Clara in 2014.